Today we have a back from the UK. 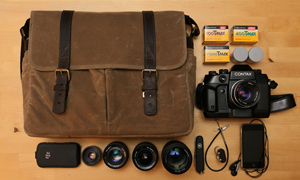 Martin is a hobbyist who has been shooting for years (much like myself) and has a cracking film bag for us all. 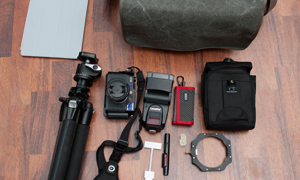 This is almost identical to the setup I used to shoot when I was a student (on a BTEC Graphic Design course no less), including the Cokin filters. Check it out. I live in Sheerness, south east of the UK, and had a passing interest in photography most of my life which rubbed off from my father when I was young lad. I did a City & Guilds Photographers Assistants course in the late 1980’s, followed by a two year BTEC Graphic Design course but after all that ended up being a truck driver. Something went wrong along the way! For about ten years I did hardy any photography at all until six years ago. Didn’t have the time nor the money to really do much with a camera. I just had too many other hobbies. So having got into my mid fortes, divorced, a bit wiser, and more money in my pocket, my other hobbies I gave away, sold and knuckled down to just one interest… taking pictures, and now especially using film. Is it just me, or does everyone look at the back of their film camera expecting to see the image they’ve just taken… OK, it’s just me then. Having got back into photography the digital way, I hadn’t taken much notice of film like many. The ease of producing digital images with the ability to change ISO at will or from colour to black & white is great, but some how I missed the simplicity of a film camera and old terms like film emulsion and grain. Sorry, what’s noise? I still shoot a lot digitally but film is not far behind. Mainly use black & white film, Kodak T MAX when I can get hold of it, although I might have to invest in a small beer fridge due to the growing amount of film in the kitchen fridge. Most of my images I take are scenes, still life, some macro images and landscapes. I try to shoot my images with different views, textures, lighting or tones. 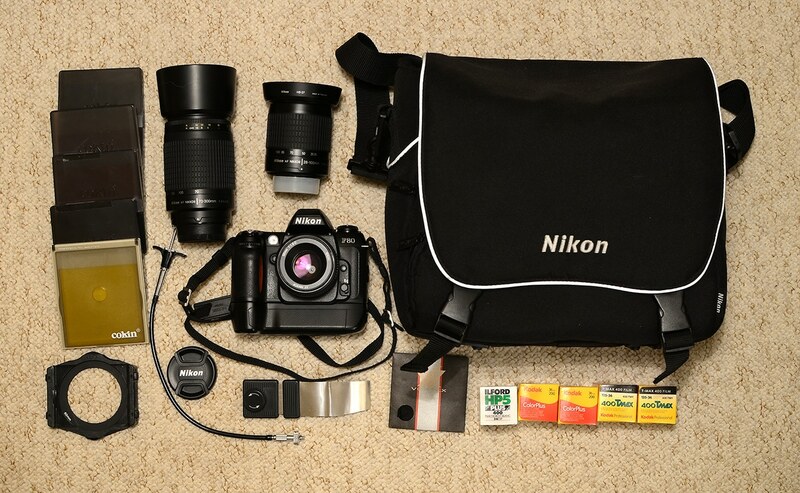 So this one of three camera bags I have, one digital Nikon DX. The other has East German Praktica cameras, lot fun to use still and this one above. 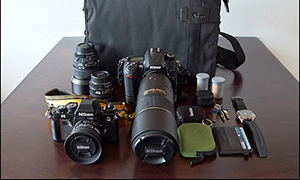 The Nikon bag was a freebie I got with my Nikon D50 (now since traded in for a Nikon D7000) Good bag, small, plenty of room but my new wife thinks its a Nikon branded ladies handbag. Nikon F80 plus battery grip, purchased from e-bay for silly money. Love the meter of this camera, never misses a trick. Nikkor 50mm F1.8-D Great lens, small, light and very sharp. Nikkor 28-100mm-G a very under rated lens I personally feel. Cheap yes, but like the 28-80 G. Sharp, light and very versatile. The Nikkor 70-300mm-G, little used, handy to have and light enough so I don’t noticed the extra weight in the bag. Cokin P filters and holder, filters for black & white plus a Cokin linear polariser. Tripod (not in image, too big!) Manfrotto Art 144 with 141 RC head. Bought second hand at a camera fair, heavy, but very sturdy. A Hama 35mm film retriever, the F80 doesn’t leave the film leader out on rewind. I knew I should have got a FE2. 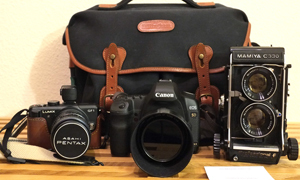 My next project is to set up my own developing, or maybe even a darkroom. Best wishes & good shooting all, Martin Smith. Thanks for sharing your bag with us, Martin. I hope that your darkroom comes to fruition, it is a very rewarding experience.